The latest issue of Pike & Predators is out now. Boat fishing is often seen as an expensive and elitist branch of predator fishing, but Paul reckons with a bit of planning and common sense there is an easy route into the world of fi shing afl oat that can also put you in with a chance of catching the fi sh of a lifetime! Jamie tells the tale of his fi rst full season of zander angling. shads. Dietmar identifi es the most consistent catchers. Danny focuses on various predator venues around the country. Eric Edwards writes about using sonar to place baits near to pike. With the release of Flyfishing for Coarse Fish, Dom lifts the lid on some exciting approaches. Dermot suggests that casting lures may be his favourite method, but even he knows when to give it a rest and go trolling. New writer to Pike & Predators, Nathan had a good season, and here he tells us about it. Nige looks in detail at essential methods for pike and other predators. 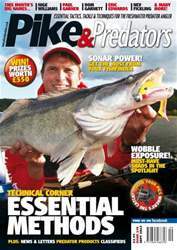 • Plus: Neville Fickling’s Predatorial, Predator Products, PAC News, Biteback and Classifieds.